If you're shaving, plucking and waxing, you can stop! And if you've heard how painful laser hair removal is, you can forget that too! 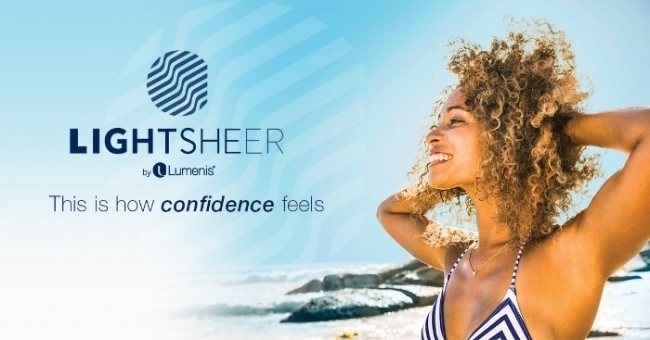 The Lumenis LightSheer laser hair removal is fast, efficacious and offers maximum patient comfort. LightSheer is 75% faster than the average hair reduction session and features the unique HIT and ChillTip technologies for state of the art comfort. Multiple treatments are required to achieve permanent hair reduction. The laser targets hair follicles that are in their early growth (anagen) phase and not all hairs are in the same phase at the same time. Nothing removes all hair forever and ever. You will need a touch up occasionally. That may be in a couple of years, or if you suffer from hormonal conditions like PCOS you may need them more than once a year. Also be aware that blonde and gray hair do not respond well to laser hair removal. LightSheer uses a state-of-the-art 805nm diode laser, which ensures safety for all skin types. The HIT technology incorporates suction to elevate and gently stretch the skin. In doing so the laser achieves maximum absorption into hair follicles and the ability to cover larger areas quicker. The ChillTip technology is a cooling system that even further enhances comfort. You can not have significant tanning in the sun 2 weeks prior to treatment and can not use a tanning bed. We also can not do your treatment if you have fake tanner on unless you can completely exfoliate it off prior to treatment. You must also be off Accutane, retinols and certain antibiotics at least two weeks prior to treatment. You should not pluck, tweeze or wax at least 4 weeks prior to laser hair removal. Please shave the area to be treated the night before. If we have to shave the area, you will be charged an additional fee. The appearance of the treated areas after laser hair removal will vary depending on your skin type. During treatment, some hairs will shed from the follicle immediately, while the remaining hairs will shed in the following weeks. Transient redness and swelling around the hair follicle may appear immediately after treatment, but this is in fact a positive result indicating the hair follicles' response to the treatment. You cannot use a tanning bed during your series of treatments to avoid burns. Extended sun exposure is not recommended after laser hair removal either and sunscreen is always necessary. Treatments are typically done 4-6 weeks apart.